Some instructions for flashing/uploading/writing the MultiWii program/sketch to a Mini (MultiWii Control) MWC Flight Control Board to a computer. Here is the link to where I bought everything for this work. This instruction should work with other Wii Motion Plus and a Arduino pro mini board. First you need to download the following applications into your computer. You need to connect your board to your computer. Here are another posts for how to connect the board to a computer and how to calibrate ESC with MultiWii program. You need to download the MultiWii program. Here is the link to download. The MultiWii program is in the MultiWii unzipped file. The other MultiWiiConf file has the GUI application for you to adjust and confirm your board settings and configurations. Arduino application, that is used for setting up and editing the MultiWii program/sketch, will be used for flashing/uploading the program into the board. Here is the link to download. Choose the Arduino IDE and select the one fits your computer to download. Here are a few editing that I did to the sketch in the congf.h tap. 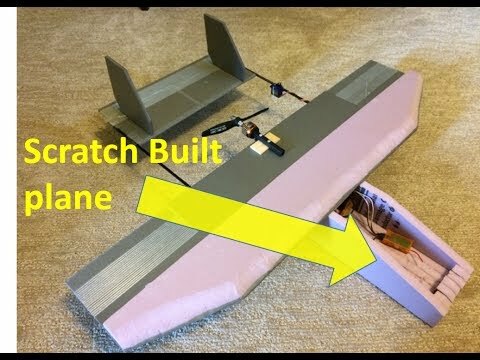 I have a Quadcopter X type, I use this as an example for everyone. Uncomment --- #define HK_MultiWii_SE_V2 ..... this is for HK Mini MWC board. Uncomment --- #define SERIAL_SUM_PPM .... please select the one match your TX brand. Next, you need to select the Board Type and Serial Port under Tools. Last is to save, compile and then upload. For this Mini MWC board, you need to connect the ground to the programming contact spot on the board while you start uploading the sketch. 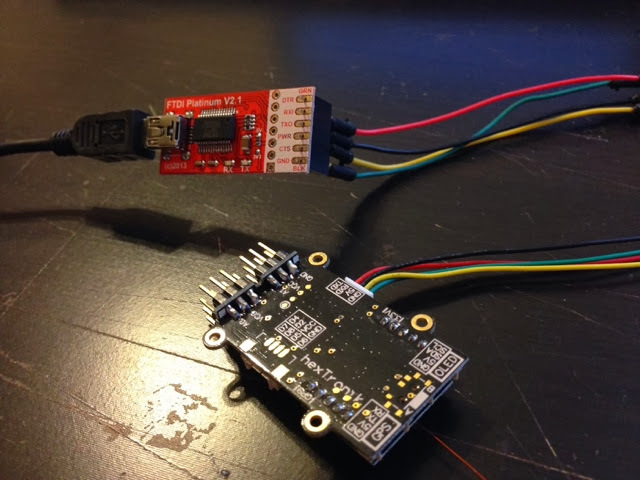 Immediately disconnect the ground connection from the spot as soon as you see the FTDI Tx LED start flashing. During the uploading process, both Tx and Rx LED's should be flashing. Once the TX and RX LED's stop flashing which means that the uploading process is completed. Hello. I'm trying to do what you wrote but I think there is a problem with my mwc. I recently bought it and don't have a DSM2 Tx yet. I've connected all pins correctly, then put usb to computer. I opened MultiWiiConf and selected the COM port but there was no change on MultiWiiConf screen. I've thought maybe it needs to upload the sketch before use. So I tried to flash as you wrote but I missed that I should have disconnect ground connection from reset probe while It's uploading. I was getting "avrdude: stk500_getsync(): not in sync: resp=0x30" error. Then I tried to flash it without any connection between ground and reset probe and I got "avrdude: stk500_getsync(): not in sync: resp=0x00" so I thought at least they communicate.. I've tried these a few times and after 1 day I read more carefully your article and I saw what you say about reset probe. I've tried it and again "avrdude: stk500_getsync(): not in sync: resp=0x00" error. But this time WHATEVER I do, I get that error. I tried what I did when I get 0x30 error but today all errors are 0x00. Seems like your board did not flash with the sketch. Did you see the FTDI board LED light flashing when uploading the sketch to the board? Did you select the correct Board Type in Arduino before uploading the sketch? Keep in mind the following steps are a bit tricky. I failed a few times before. ""you need to connect the ground to the programming contact spot on the board while you start uploading the sketch. Immediately disconnect the ground connection from the spot as soon as you see the FTDI Tx LED start flashing. """""" I use a different usb rs232 adapter and it has no lights, here its link: http://www.dorji.com/pro/kits/demokits2.html (DAC13, first one) I selected Arduino Mini w/ ATmega 328p. I was disconnecting the ground when arduino says "starting to upload" Isn't this right? I don't know the process of when to disconnect ground connection using the rs232 adapter. If I remember correctly, the arduino says "starting to upload" after I disconnect ground connection. But again, I don't know the correct steps using the rs232. I thought FTDI USB board which HobbyKing provides is just a standart usb rs232 converter board so I've bought another one from my country in order to reduce shipping time. Isn't it a usb rs232 converter? I don't know anything about usb rs232 so I don't know the steps using it to upload the firmware. I have a question. Obviously when writing the arduino sketch to the board you have to use the pogo stick to start the ftdi read write process but is the same applicable to the GUI? From what i understand the GUI is a visual platform which can change settings as the sketch does. So if i change something in the GUI and i click on write does it then write these setting to the MINI MWC (when connected) Or do i need to use the pogo programming stick to initiate the process as when writing to the board from there arduino sketch? Change settings via GUI doesn't need to use the ground probe. All you need to do is to click the "Write" button in the GUI. The changes should be uploaded to the board. I recommend to disconnect and reconnect the board to the GUI then click the "Read" button to verify the changes have been made. Just to say one of the problems i had when using the ftdi programmer was that i did not have the drivers installed on my mac. Once i found the drivers (there is a link on the arduino help page and some youtube videos on this) i started to make progress. This may help some people. Yes, it needs FTDI driver in order to talk to the board. Arduino: 1.0.6 (Mac OS X), Board: "Arduino Pro or Pro Mini (5V, 16 MHz) w/ ATmega328"
i was just wondering if anyone can help with my problem? you selected the correct board. I may help if you can tell me you step by step. thanks for the help, i have first edited the parameters in the config.h and then directly tried to flash this to the board and i got the error. i am not sure about how i select the board and if there is a particular way to select the board. i will try again and go over the instructions you posted once again. also, i noticed that at the end of my error report there is a line which says that the programmer is not responding. is this a hardware issue? 1, Did you select the serial port? 2, Did you select the programmer? 3, Did you see the led light flashing in the FTDI ? Have I selected the correct programmer? When the led on the ftdi flashes, have you disconnect the probe wire immediately? All that i did, but no results with my both controller boards. One of them had no flying any time.. Thanks for answering and comments. These controllers i will not buye anymore.